It's a funny thing. As soon as you say something is controversial, it becomes controversial. The scientific reality of the 'Hockey Stick', is completely uncontroversial when you consider the statistical significance of the arguments presented. As usual, people are taking the science out of context of its actual relevance. The hockey stick is still a hockey stick and still relevant science. It was never removed from IPCC reports. It is a solid piece of a puzzle that shows a serious change in our climate system that is not only human caused, but profoundly impactful on the global economy of system interactions. The 'hockey stick' is probably one of the most scientifically reviewed items in the history of modern science. When all was said and done, the mistakes that mathematician Steven McIntyre and economist Ross McKitrick pointed out, to a congressional subcommittee, were 'statistically insignificant' and deemed irrelevant to the overall strength of the model. 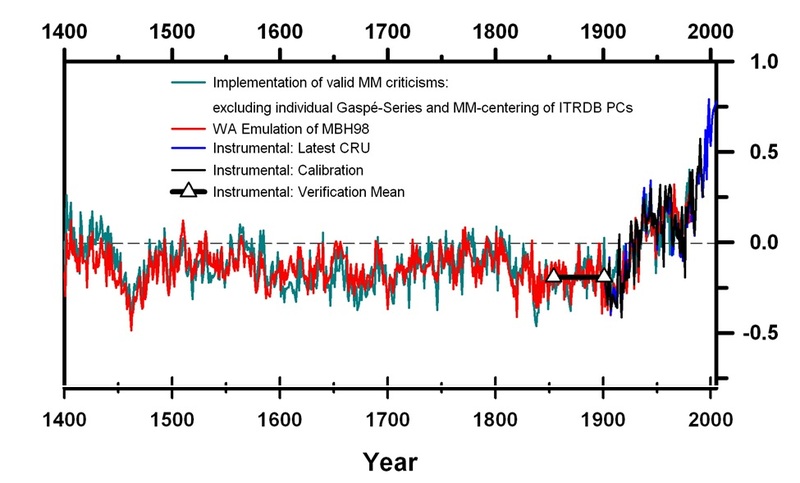 What is even more interesting is that you can throw out the MBH 'hockey stick' and still see with all the collected science that the climate is still warmer now than in the MWP (medieval warm period). Was the 'Hockey Stick' removed from IPCC reports? No, still a Hockey Stick. If you thought the hockey stick is no longer in IPCC reports... well look again. There it is in the top left hand corner MBH1999. Yes, it's still a hockey stick and yes it is still in the reports. Nothing has been removed. You may also notice that the other Global Climate Models indicate similar warming patterns and none of the indicate climate cooling trends. Here it is with the McIntyre/McKitrick corrections applied... still a Hockey Stick. Because it bears repeating: THE HOCKEY STICK, EVEN WITH CORRECTIONS APPLIED, IS STILL A HOCKEY STICK. 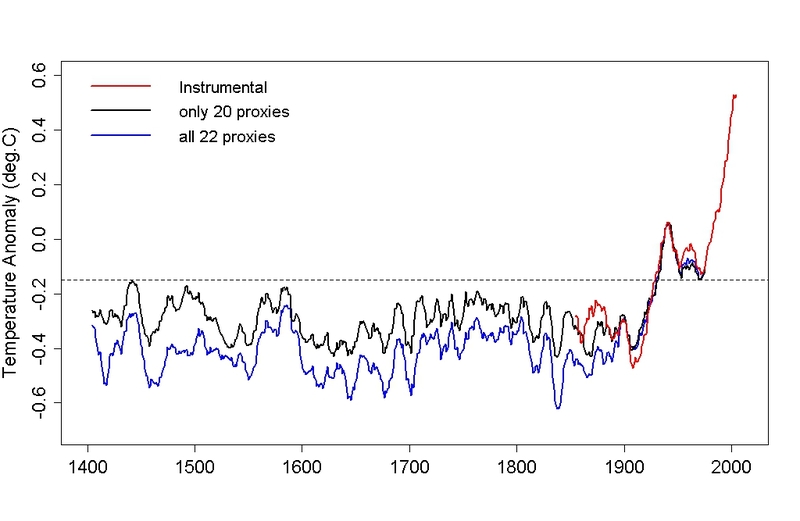 Here's the Hockey Stick comparing 20 vs. 22 proxies which has been argued destroys the Hockey Stick... but it's still a Hockey Stick. Here's the 'Hockey Stick' compared to a bunch of other proxies that don't even use tree ring data... and it's still a Hockey Stick. Here's the 'Hockey Stick' from Jones/Mann 2004 with another mix of proxies ...still a Hockey Stick. Comparison of CPS: hemisphere screened (A); “no dendro” (B); and EIV full global (C) and “no dendro” (D). NH reconstructions (colored curves; 95% confidence intervals shown by lightly shaded regions of similar color) with decadally smoothed CRU NH land mean series (thick black curve). Reconstructions are shown over late (A.D. 1950–1995) and early (A.D. 1850–1895) validation intervals corresponding to early (A.D. 1850–1949) and late (1896–1995) calibration experiments respectively. RE validation scores are shown (Insets) as a function of the starting date of the network along with 90% and 95% significance levels based on Monte Carlo experiments. Only reconstructions that passed validation are shown. Color bar indicates network starting dates. Studies are beginning to get a more solid picture of Southern Hemisphere temperatures. The graph below is an examination of temperatures across Australia. The Hockey Stick shape is evident. "They use an ensemble of 3000 different reconstructions, using different methods and different subsets of the proxy network. Worth noting is that while some tree rings are used (which can’t be avoided, as there simply aren’t any other data for some time periods), the reconstruction relies equally on coral records, which are not subject to the same potential (though often-overstated) issues at low frequencies. (Eric Steig)"
J. Gergis, R. Neukom, S.J. Phipps, A.J.E. Gallant, and D.J. Karoly, "Evidence of unusual late 20th century warming from an Australasian temperature reconstruction spanning the last millennium", Journal of Climate, 2012, pp. 120518103842003-. DOI. So, any way you slice it, you still get a hockey stick. It's because the pattern shows up in not just tree rings, but in essentially all the data sets combined with the instrumental record that makes the Hockey stick a 'Robust' piece of science. The most reviewed, analyzed and discussed piece of climate science in history, after hundreds of peer reviewed studies is still valid. Science is never perfect, but it does not have to be perfect to be illustrative and produce robust or even just reasonable results. As the saying goes from Voltaire, 'Don't let the perfect be the enemy of the good'. Models are just models and some are better than others. In the case of the 'Hockey Stick' the results are 'robust' due to confirmations from entirely different temperature reconstructions from entirely different areas other than tree ring studies. The best science available, with and without tree rings, shows that we are warming and the pictures, when you mix the paleo data and the instrumental records still look like a hockey stick. I'm not perfect, the 'Hockey Stick' is not perfect, models are not perfect and yet the earth is still warming? Hmmm... now that that is settled, maybe people should start learning about natural cycle and radiative forcing? The 'Hockey Stick' pattern shows up in the temperature record whether or not you use the tree-ring data, or with or without tree ring data, if you prefer. So in that sense, who cares about the controversy over the tree-ring data, other than those that simply don't like the conclusion, that the results in the data from multiple proxies, models, sources, etc., are robust. But why would anyone want to throw out 'good data' that helps confirm what is 'clear' in the non tree ring data? Scientifically you wouldn't. So we can reasonably conclude that the Conclusion, The Conclusion About the Conclusion, and the Conclusion About the Conclusion of the Conclusion, is that the Hockey Stick is sound science and portrays the temperature record in a robust manner. 2005-01: RealClimate - What If … the “Hockey Stick” Were Wrong? 2004-12: RealClimate - Myth vs. 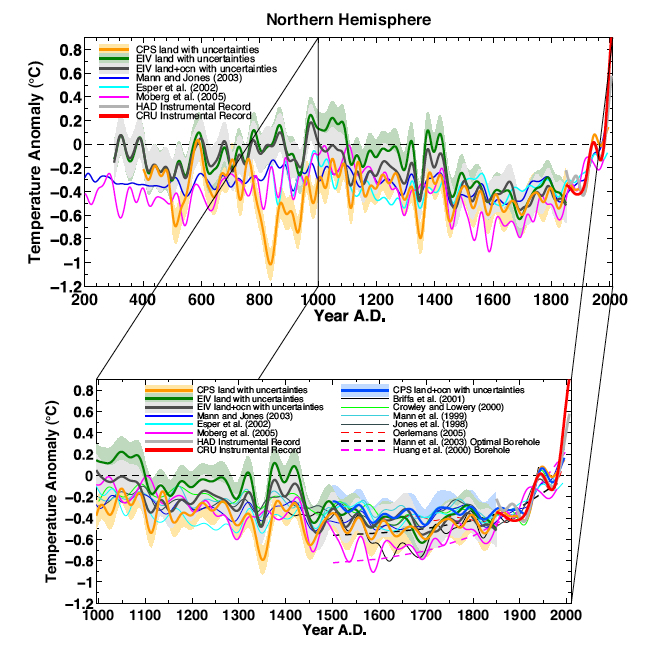 Fact Regarding the "Hockey Stick"
2004-12: RealClimate - Temperature Variations in Past Centuries and the so-called "Hockey Stick"